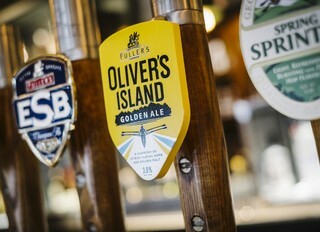 After experimental brewing, branding and market research, we have launched a new permanent ale - Oliver's Island. At 3.8% ABV, this golden cask ale is very easy to drink with a crisp bite in its finish, aided by the citrus and tropical fruit notes from the Goldings hops used in the brew. The brewing process ensures a refreshing and new flavour to the Fuller's range, described as a 'harmony of Citrus, Floral Hops and Golden Malt'. There's also a special ingredient suggested by beer writer and sommALEier Melissa Cole. Orange peel is added to the brew to create a genuine and refreshing zesty flavour, reminiscent of the characteristic orange hints produced from the Fuller's yeast. "We’re brewing this beer with British Pale Ale malt and Cara gold malt which gives biscuit notes, but also with oat and wheat to form a full body. Using Goldings and Liberty hops brings a citrus character to the beer and our addition of real orange peel in the copper means there are strong citrus notes in the finish." Want to know more? Head over to the Oliver's Island page and find your nearest pint.